We returned from our short visit to the Monastery of the Holy Transfiguration yesterday evening. It was a good trip and Mother Paula sends her greetings to the parish. I am forwarding an attached letter written by the Abbess, Mother Christophora. It explains the latest developments in the monastery’s current building projects. There have been some real changes in the last year or so, and these changes have enhanced the over-all beauty and effectiveness of the monastery in a very positive manner. 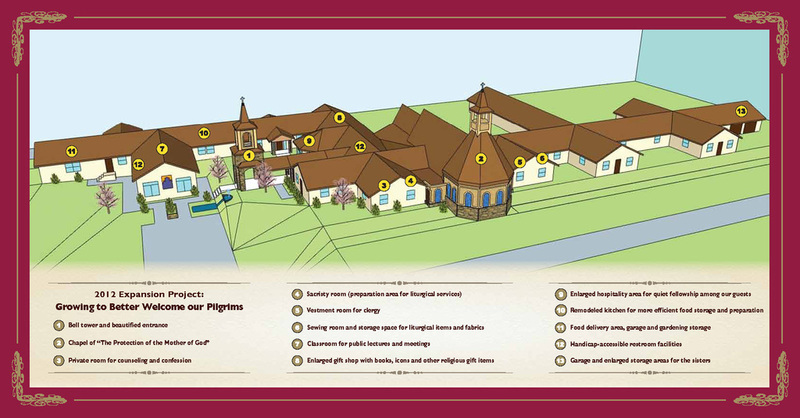 Mother Christophora informed me that the monastery has received some donations from members of our parish, so this will prove especially informative to those who have donated to the recent building fund campaign. We come to you today with much gratitude and joy. Your donation to our monastery this summer is so very much appreciated and such a great help to us. All of our pilgrims and guests benefit from your kindness to us as well. The summer has brought many pilgrims – guests and families staying overnight in our guesthouses, daily visitors and groups. It certainly seems like more and more people come every year. Thank you very much for your assistance to us! In addition to receiving guests we have also been very busy here with our Building Project. As Phase 1 was coming to a conclusion in early May, we made a decision to continue on and to proceed with outdoor improvements. This work involves new entrance stairs as well as all new handicap accessible sidewalks; a front plaza area for guest conversation and improved traffic flow; painting of the entire complex; and a blacktop driveway alongside our pavilion and to our new garage. The enclosed photos will give you a glimpse of what you will see when you next visit. I am sure you will appreciate the improvements! Finally I wish to remind you of our upcoming pilgrimage and feast day, the Transfiguration of our Lord. On Monday and Tuesday, August 5 and 6, we will welcome our guest hierarch, His Grace, Bishop John (Abdalah), along with His Eminence, Archbishop Nathaniel, visiting clergy and pilgrims. The service on Monday evening begins at 6:00. Liturgy on Tuesday will begin at 9:30, with the Sacrament of Holy Unction at 2:30. During the afternoon there will be time for browsing our new bookstore and other specialty tables. Please be with us if you can. Our website has further photos of our project as well as a link to view our chapel services. 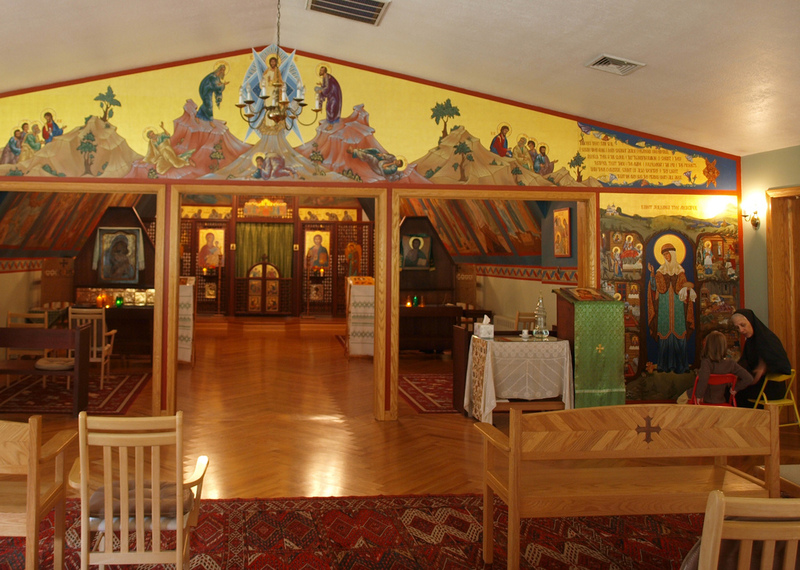 Visit us there at OrthodoxMonasteryEllwoodCity.org. Please pray for us. May God bless you all! Here are some excellent photos, taken by Florentina Popescu earlier this week, of the chapel at the Holy Transfiguration Monastery in Ellwood City. The nuns, under the direction of Mother Christophora, continue to beautify the interior of the chapel through a series of high-quality icons and frescoes that surround the worshipper with these “windows into eternity.” In the corner of the second photo you can see Mother Paula explaining a wall-icon to our granddaughter Nadia.